The limited warranty and exclusive remedy below cover WindsorONE® Protected† Trim Boards that have been INSTALLED AND MAINTAINED IN ACCORDANCE WITH THE WindsorONE INSTALLATION INSTRUCTIONS. The limited warranty is offered only on the conditions stated herein, and the remedies stated herein are the exclusive remedies for any alleged breach thereof or any other product complaint. Failure to install or maintain WindsorONE® Protected Trim Boards according to the above written instructions will affect performance and void the limited warranty. 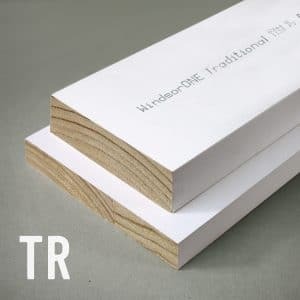 WindsorONE® Protected Trim Boards are supplied for use as trim, fascia and other trim applications in single residences and larger commercial buildings. These wood Trim Boards are finger-jointed, glued, treated with Woodlife is Inside® wood-protecting materials supplied by Kop-Coat, Inc., and then primer-coated for exterior exposures. Windsor Surry Company protects its WindsorONE® Protected Trim Boards with Kop-Coat materials for additional protection against fungal decay and termite damage. Windsor Surry Company and affiliates offer a limited warranty against fungal decay and termite attack of its WindsorONE® Protected Trim Boards to the original purchaser/occupant (“first owner”) thereof: For 30 years after initial purchase, should any WindsorONE® Protected Trim Boards that have been installed and maintained according to WindsorONE Exterior Trim Board Installation & Maintenance Manual become structurally unserviceable due to fungal decay or termite damage, Windsor Surry Company will provide replacement product without charge. This limited warranty shall expire 30 years from the purchase date, does not cover installation or other costs, and is available only to the first owner. Windsor Surry Company and its affiliates offer a limited warranty of the glued joints of its WindsorONE® Protected Trim Boards; for 10 years after initial purchase, should any WindsorONE® Protected Trim Board that has been installed and maintained according to WindsorONE® Protected written instructions incur glued joint failure that damages its structural serviceability, Windsor Surry Company will provide replacement product without charge. This limited warranty shall expire 10 years from date of purchase, does not cover installation or other costs, and extends only to the first owner. Windsor Surry Company also extends a separate limited warranty of the primer coating of its WindsorONE® Protected Trim Boards to the first owner thereof. For 5 years after initial purchase, should any WindsorONE® Protected Trim Board that has been installed and maintained according to WindsorONE Exterior Trim Board Installation & Maintenance Manual incur paint primer peeling, Windsor Surry Company will provide suitable primer and topcoat for repair. This limited warranty shall expire 5 years from the date of purchase, does not cover application or other costs, and extends only to the first owner. For the limited warranty to apply, (i) the subject WindsorONE® Protected Trim Board must have been installed and maintained according to WindsorONE® Protected written instructions, (ii) the first owner must contact Windsor Surry Company immediately upon discovery of the condition and provide an invoice to verify their purchase and the product’s origin of manufacture, (iii) provide photographs depicting the concern, and (iv) if Windsor Surry Company deems necessary, must also allow Windsor Surry Company’s agent to enter the property and inspect the structure to examine, photograph and sample the damaged product. j) Or labor to repair or replace the damaged WindsorONE® Protected Trim Boards. SUCH REPLACEMENT OF DEFECTIVE BOARD OR PAINT IS THE EXCLUSIVE REMEDY FOR THIS LIMITED WARRANTY. WINDSOR SURRY COMPANY SHALL NOT, UNDER ANY CIRCUMSTANCES, BE LIABLE FOR ANY DIRECT, INDIRECT, SPECIAL, INCIDENTAL, CONSEQUENTIAL OR OTHER DAMAGES DUE TO DEFECT OR FAILURE OF ITS PRODUCTS, OR FAILURE OF ANY PRODUCTS OF ANY SUPPLIER OF MATERIALS OR EQUIPMENT TO WINDSOR SURRY COMPANY. EXCEPT FOR THE SPECIFIC LIMITED WARRANTY ABOVE, WINDSOR SURRY COMPANY AND ITS AFFILIATES GIVE NO OTHER WARRANTIES, EXPRESS OR IMPLIED, INCLUDING ANY IMPLIED WARRANTY OF MERCHANTABILITY OR FITNESS FOR PARTICULAR PURPOSE, WHICH ARE HEREBY EXPRESSLY DISCLAIMED AND EXCLUDED. 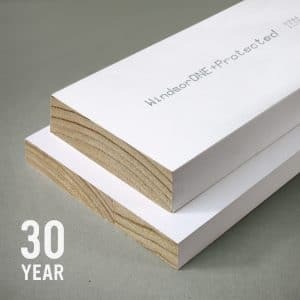 The above constitutes an exhaustive statement of the limited warranty by, and remedies against, Windsor Surry Company and affiliates for WindsorONE® Protected Trim Boards. No agent or employee of Windsor Surry Company, its affiliates, distributors or sales agencies are authorized to make any different statement or warranty than as stated above. Any statement to the contrary is void. This warranty is effective May 17, 2017 and supersedes all previously published warranties for WindsorONE® Protected Trim Boards. WindsorONE® Protected Trim Boards includes products also labeled as "WindsorONE+® Protected" Trim Boards.